Exploring difficult emotions and experiences may be the key to loosening their hold over us. Try this 10-minute mindfulness practice from Patricia Rockman, MD. Becoming familiar with a difficult emotion means getting interested and curious about it, like you might do when visiting a new city. Take it slow, uncovering new “territory” a bit at a time instead of trying to get to know it all at once. As you do, you learn that you can sit with uncomfortable feelings, and that they will eventually pass. Over time, you develop resilience, self-knowledge, and trust in yourself—the best antidotes to the self-judgment that shame inspires. Thoughts and feelings are larger and scarier when they’re left unexplored and kept in the shadows. Whether you’re experiencing feelings of shame right now or have buried shame that you’ve been avoiding, are you willing to get to know it a bit better? Remember, thoughts and feelings are larger and scarier when they’re left unexplored and kept in the shadows. 1) Take a comfortable meditation posture, eyes closed if comfortable. Begin by bringing attention to the body sitting. Attending to the base of the body as it makes contact with the surface you are resting on. Allowing the jaw to soften, shoulder blades sliding down the back and hands at rest in the lap or on your thighs. 2) Turn your attention to the sensations of breathing at the level of the belly. Attending to the in breath and the out breath, the rising and falling of the abdomen. Perhaps letting the breath move in and out of the body naturally, as best you can. 3) And now, gently bringing to mind an experience or memory, a time in which you felt shame. Maybe it was something you did or something that someone else said about you or to you. Whatever it is, turning toward this memory, experience, or situation gently, as best you can, checking in with what thoughts are present, what emotions, and what body sensations. Without needing to change or fix anything, beginning to explore what is arising or what is here right now. If there are specific thoughts, as best you can experiencing them as sensations of the mind, as events that come and go. If there are emotions, naming or labeling them as they make themselves known. Saying to yourself shame is here or fear, anxiety or guilt, whatever it is and staying with these for a few moments. 4) And now, shifting your attention to any associated sensations in the body. Investigate these with friendly interest, getting curious about them, even if they’re unwanted or intense……really getting to know them if this is possible in this moment. If the sensations are particularly intense or strong, saying to yourself, “this is a moment of difficulty. I can be with this, it’s already here.” If it is helpful breathing into the sensations, expanding on the in breath and softening on the out breath, staying with these sensations as long as they are capturing your attention. Can I let this be as it is? Does it need addressing? Do I have to take an action? If so, what? Can I shift my attitude, bringing a different perspective to this experience? This web extra provides additional information related to an article titled, “The Downward Spiral of Shame,” which appeared in the October 2017 issue of Mindful magazine. Self-compassion. Calm. Joy. Resilience. Trust. The world needs more of these. This is why the staff at Mindful works hard every day to bring the best practices, advice, and insights from top mindfulness experts to individuals and communities around the globe. As a small, dedicated non-profit, Mindful brings compassion and connection into the hearts, homes, and communities of millions of our readers. If you find value and meaning in what we do and would like to help make the world more mindful, please donate to Mindful today. Thank you! 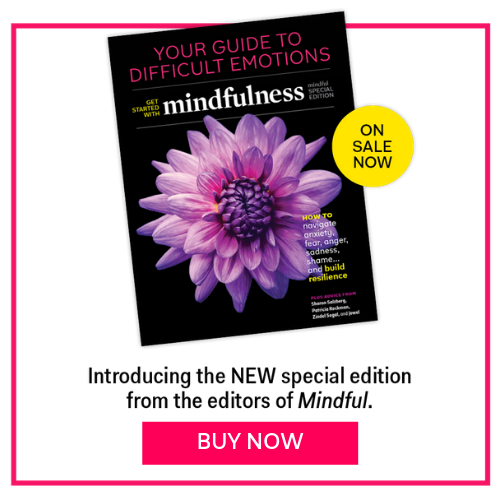 Get the latest in mindfulness delivered to your inbox. Patricia Rockman, MD, CCFP, FCFP is a family physician with a focused practice in mental health. She is the Senior Director of Education and Clinical Services at the Centre for Mindfulness Studies, Toronto. She is an associate professor at the University of Toronto, Department of Family Medicine, cross appointed to Psychiatry. She has extensive experience practicing individual psychotherapy, leading therapy groups, and training healthcare providers in mindfulness based interventions, cognitive behaviour therapy, and change management for stress reduction. She is a freelance writer, yoga teacher, and meditation practitioner. Weekly newsletters delivering practices, research and special offers from our Mindful community straight to your inbox.